Algerian terrorist Mokhtar Belmokhtar has been killed in a US air strike in Libya, officials say. Mokhtar Belmokhtar, 43, and other fighters were killed in the raid by aircraft in the eastern city of Ajdabiya, a statement from Libya’s government said. The US has confirmed Mokhtar Belmokhtar was targeted but did not say he had died. The Pentagon described the strike as successful and that officials were still assessing its results. It would “provide more details as appropriate” said spokesman Colonel Steve Warren. There have been incorrect reports of Mokhtar Belmokhtar’s death in the past. Born in Algeria, Mokhtar Belmokhtar was a former senior figure in al-Qaeda in the Islamic Maghreb (AQIM), but left to form his own militia. 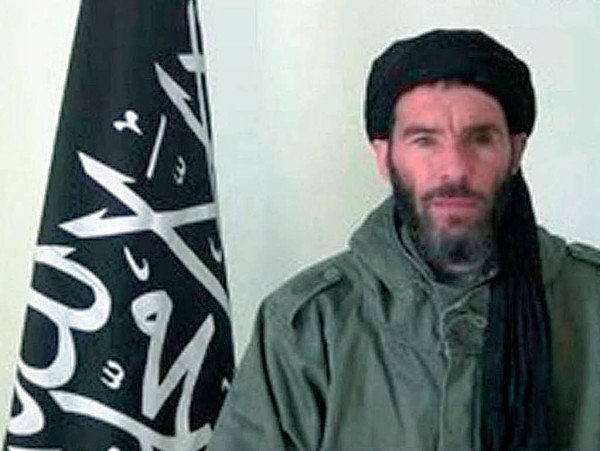 Mokhtar Belmokhtar gained notoriety with the attack on the In Amenas gas plant in Algeria in 2013, when about 800 people were taken hostage and 40 killed, most of them foreigners, including three Americans. The US has filed terror charges against him and officials said they believed he remained a threat to Western interests. The Libyan government said the strike came after consultation with the US. Their statement said it resulted in the death of the “terrorist Belmokhtar”. Libya has been in chaos since the ousting of Muammar Gaddafi in 2011. Its internationally recognized parliament is operating in exile in the eastern port of Tobruk. A rival parliament, the Islamist-dominated General National Congress, is nearly 600 miles to the west in Tripoli. Rival militia has been battling to fill the power vacuum, with Islamic State militants battling other Islamists in the east.